Christie. 1968. Barbie’s first African American friend. Christie was part of the first group of talking Barbie dolls introduced in 1968, and was soon followed by Twist ‘n’ Turn Christie. Both dolls featured more ethnic features, brown coloured eyes and a short afro hair-do that often oxidised over time to a vibrant red. 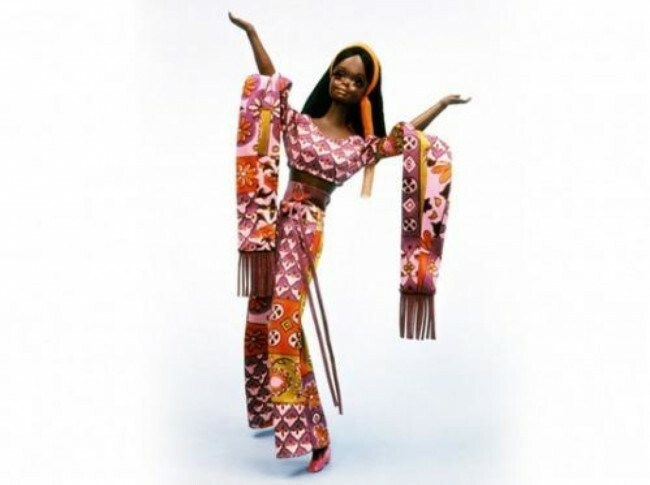 Interestingly a black version of Barbie’s cousin, Francie, was introduced in 1967. Known as ‘Black Francie’, Barbie had an AA cousin before she had an AA friend. This doll is now highly sought after by collectors due to its limited release. Christie was reincarnated in 1969 as ‘Julia’ a sassy, shorter haired version of the doll modelled after the Diahann Carroll TV show character of the same name. Julia was a widowed, single mother and a nurse. Very progressive themes in a very conservative era, that usually only depicted AA characters on television as servants. Christie kept pace with Barbie over the years, adopting many of Barbie’s popular incarnations including; Malibu Christie, Superstar Christie, Fashion Photo Christie, Magic Moves Christie, Pivotal Mod Christie and one of my all time favourites – Live Action Christie! Live Action Christie featured long silky hair, rooted lashes and orange coloured eyes that matched her psychedelic threads. She had a live action body that meant she could do the twist, wahtusi, frug and I am sure mash potato if she really wanted to. Live Action Christie embodied everything that was carefree and cool. I briefly had a fascination with the Mego Farah Fawcett doll that coincided, at the time, with my obsession with the TV show Charlie’s Angels. Farah Fawcett in all her flicked hair glory. I knew there was only one place I could possibly find her, ‘Love Saves The Day’ in New York City. So I set off in search. I was right. She was there. And I bought her on my first trip to the Big Apple. Mint in Box. But Farah paled in comparison when I chanced upon Twiggy. The genius of the Twiggy doll was that she perfectly re-used the Casey face mold. Heavily accented, painted on lashes perfectly complimenting her “Real Eyelashes!” Combine this with Francie’s lithe body, a beautiful white blond asymmetric bob and top it all off with a big toothy grin. Like I said, perfect! 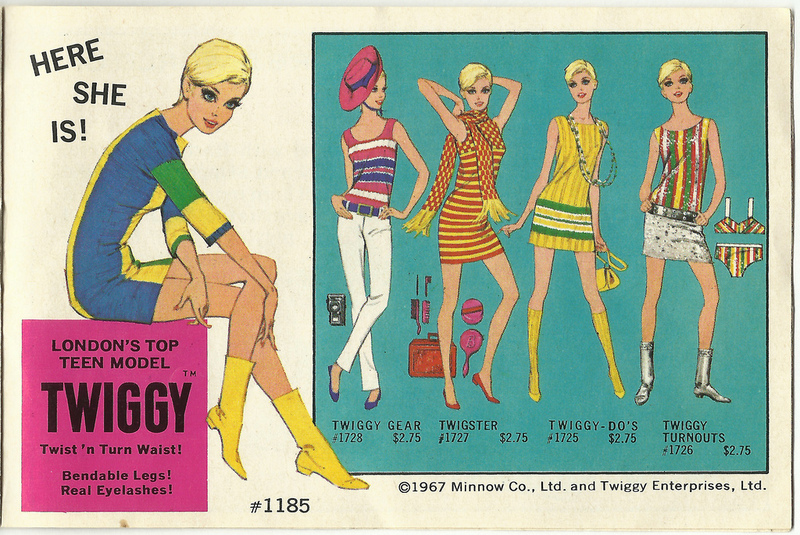 Twiggy came with four G-Roovy outfits; Twiggy Gear, Twigster, Twiggy-Do’s and Twiggy Turn Outs. Each one a little piece of carefree 60’s perfection. Just like Farah, I knew there was only one place I would find her. Once again I returned to New York, with a new quest. It wasn’t hard to find Twiggy. The East Village. 40’s50’s60’s, a little off beat collectible and toy shop. Twiggy cost the princely sum of US $229. She was still wearing her original striped dress and yellow mod boots. At the time the Australian dollar was worth just over half the US dollar. You do the math. She was, however, in great nick. I carried my precious little cargo back to Sydney in my hand luggage, wrapped her in tissue and put her away in a box. Over time Twiggy’s arms paled a little. So did the tip of her nose. A common problem with these dolls. When I unexpectedly ‘left’ my job I decided to sell Twiggy. I immediately regretted the decision, but consoled myself with the thought that one day I would find her again. Mint in Box. No paling. But what is really exciting is when you find a doll at a price that just can’t be ignored. Don’t ever let anyone tell you when something seems too good to be true it is too good to be true…. That’s just not true! 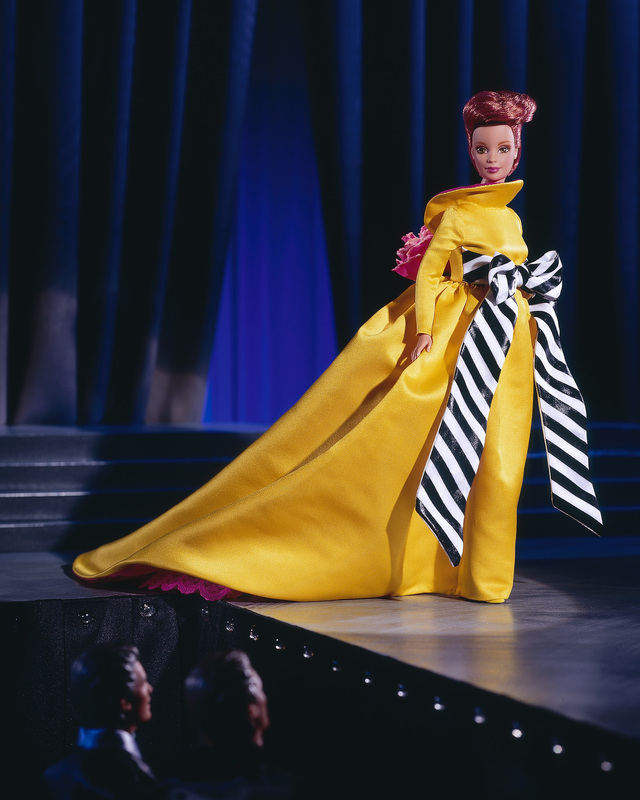 In true Bill Blass style, this Doll is W.O.W. Yellow satin dress, crimson satin lining, signature Bill Blass B & W stripe, giant rose floral motif. I’m not sure which face sculpt is used on this doll, but she smirks beguilingly and her make-up suits her outfit beautifully. Her hair is a perfect sculpted red, reminiscent of Linda Evangelista at the height if her Supermodel fame. When this Doll came out she was expensive. I think if you tried to find her online today she would still be expensive. I found her BNIB (brand new in box) for the handsome sum of $35 Canadian dollars. Her original price of $112 Canadian dollars was still on the box. It cost more to ship! Stacey. Barbie’s ‘British Chum’. Introduced in 1967, Stacey arrived from Swinging London and turned Barbie’s world Mod-side down! Collectors always have favourites. Usually many favourites and usually favourites that change. All the time. Every collector has one. The Doll that becomes the Holy Grail. You find yourself constantly google searching it, google image searching it and of course there are always at least three lined up in your ebay watch list… Usually they are either extremely rare or just very expensive. Sometimes both. 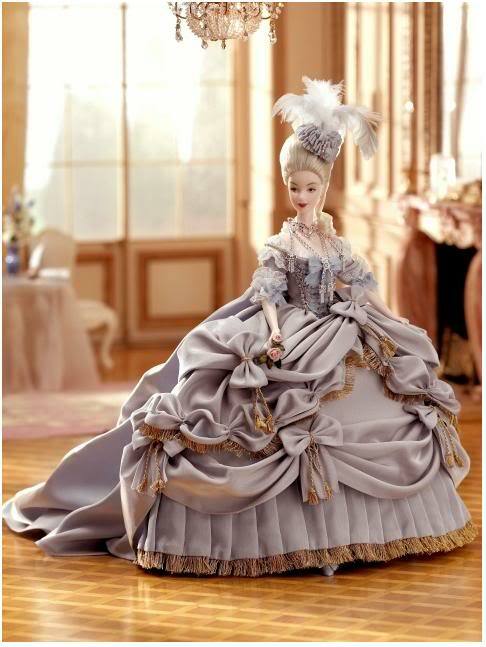 For me, that Doll was Marie Antoinette.